How can United integrate Rooney, Thiago, Strootman and Kagawa in the same team? HomeNewsHow can Man United integrate Rooney, Thiago, Strootman and Kagawa in the same team? How can Man United integrate Rooney, Thiago, Strootman and Kagawa in the same team? David Moyes has returned from vacation to formally kickstart his Manchester United managerial career. Currently embroiled in hectic transfer season, the Scot is rumored to be eyeing a double swoop for midfielders Kevin Strootman and Thiago Alcantara for a combined sum of £35m. At the same time, probably looking at the progress United appear to be making in the summer, Wayne Rooney is expected to tell Moyes about his desire to stay put at Old Trafford. The biggest challenge Moyes will face at United will be to integrate Shinji Kagawa, Rooney, Thiago and Strootman in the same starting XI- players with distinct playing styles but all worthy of a starting spot. RM provides a solution to the problem. In United’s 2-1 win over Southampton in January, there was no “true” winger in Sir Alex Ferguson’s team sheet. Danny Welbeck and Shinji Kagawa started as the flank-men but continually drifted in with the full-backs (Patrice Evra and Phil Jones) making timely overlaps. Although the Red Devils only scored twice in the first-half (the duration when the winger-less formation was actually utilized), their attack looked fluent and elegant, particularly considering the four were playing in the new-look set-up for the first time. There were some lapses in communication but United managed to create eight scoring chances in the first forty-five minutes, an admirable stat by any team’s standards. I feel Moyes can adopt a similar approach, but in a modified version as shown below. Michael Carrick will continue as the deep lying midfielder- pulling the strings in the midfield, while he’ll get the required defensive support from Strootman, who’ll also make some attacking runs when needed. Against Southampton, United started Anderson with Carrick. This made the Red Devils’ defense feeble as Anderson is not a defensive-minded midfielder and Welbeck and Kagawa took time to fall back because of their positional versatility. Strootman, however, can quickly anticipate counter-attacks and at-least halt them to give the attackers the time to drop back. The Dutchman will also need to surge forward to win the ball back in the final third as in the Southampton game, United were very direct with their attacks, heavily relying on crosses and needed a ball-winner in case possession was lost cheaply. Against Southampton, van Persie’s positioning was the key to United’s fluid attacking structure. His movement was superfluous and the Flying Dutchman was often swapping places with the wingers. As the centre-backs were unable to track van Persie till the flanks due to the risk of opening a massive channel, he was able to operate freely. For instance, when Kagawa (left-sided midfielder) moved centrally, he also invited the full-back, Nathaniel Clyne along with him, which opened the wide channel for van Persie. Evra provided additional support, which allowed the Red Devils to create 2-versus-1 situations against the right-midfielder, Jason Puncheon (or Clyne, if Puncheon drifted in with Kagawa). Meanwhile, at the same time, Rooney, Kagawa or Welbeck filled the space left by van Persie so that the defenders were kept busy. Sometimes, the trio would get into the penalty box for van Persie to provide a crossing target. Van Persie linked up in a similar fashion with Welbeck on the opposite wing. Sometimes the 29-year-old also dropped back to be part of the build-up play and allow one of the other attackers to play as a makeshift striker. As the following heat map shows, van Persie spent majority of the first-half operating on the wings or dropping back to create channels with his movement. In the new formation, van Persie will have the same tasks to execute. I’ve picked Rooney and Thiago Alcantara as the wingers. Now, here’s the take before I start getting criticized. I don’t want them to play as out-and-out wingers, but as attacking midfielders, drifting in and operating in a free role. Thiago has the required pace, technicality and dribbling finesse to operate as a right-sided attacking midfielder. The lad likes to make attacking runs, dribble around his marker, produce quick one-twos and most important, have optimum freedom on the pitch. Thiago can move centrally, swap places with van Persie (as described above) or Kagawa (who in my formation plays as the No 10) and play a major role in the build up to the attacks. Rooney on the other hand, takes the place of the left attacking-midfielder. He’ll play in the same role like the one during the 2007-08 Champions League winning season, when Cristiano Ronaldo played as the sole striker. Thiago and Rooney will also get into the penalty box on a regular basis (as Welbeck and Kagawa did against Southampton). 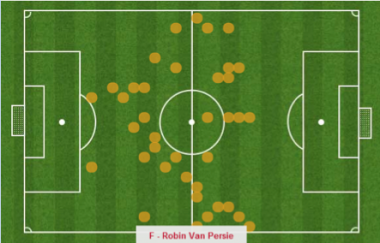 What the duo, with the help of van Persie, can often do is create 3-versus-2 situations against the centre-backs. During the Southampton match, Rooney, van Persie and Welbeck repeatedly outnumbered the two central defenders. This decimated Southampton’s defensive structure as Daniel Fox was sometimes unwilling to move centrally with Welbeck due to the threat of Jones marauding down the flank (Jay Rodriguez failed to keep Jones in check). Although Rooney was playing as the No 10, he can still do the same, along with Thiago and van Persie. In addition, Kagawa can provide them with incisive passes to get behind the back-four. With the Thiago and Rooney plucking in from the wings and the full-backs providing width, United will be also able to win the midfield battle against the teams using 4-2-3-1 or 4-3-3 formations. This formation will give Kagawa his preferred role of the No 10. The Japan international was mostly played out of position by Fergie last season, which limited his impact. When van Persie shifts to the wings or falls back, Kagawa can take up the striker role. On the other hand, he can also move out to the wings to create an extra-man advantage. Against Southampton, when Rooney played as the No 10, his freedom tormented the opposition. The defenders couldn’t risk marking the England international and if Morgan Schneiderlin tracked him all over the field, it would have left space for Kagawa or Welbeck to get in between the lines. Kagawa can do the same. Last season, Kagawa and Rooney showed glimpses of a good attacking partnership in some games that they started together. Their link-up looked promising and if United add Thiago to the mix, the Red Devils will have a monstrous attack. The attacking transition is very crucial in this formation. To understand how it can work, let’s analyze how United attacked against Southampton. One of the four attackers (mostly Rooney) generally released one of his teammates out wide (usually Kagawa or Welbeck). The receiver tried to receive the ball on the touchline so that he could run directly at the full-back. At the same time, he either got help from another attacker (usually van Persie) or from his own full-back to double up against his marker. If the winger passed the ball to the ‘helper’ (van Persie or the full-back), then he, along with the remaining attackers (three if the helper was an attacker, four if the helper was the full-back) quickly got inside the penalty area for the cross in. On the other hand, sometimes the winger tried to cut in, which gave him several options to link-up. During all this, Anderson quickly ventured into the final third so that if United lost the ball, he could help them regain it. Strootman will come in handy here. For better understanding, here’s an illustration how the transition can take place in the set-up (note: the helper in this case in Evra, not van Persie). Alternatively, here, Rooney might cross in himself, or if van Persie is the helper the latter might do what Evra did. It is to be understood that throughout the Southampton game, there was constant swapping of positions. It became difficult to exactly point out which player had what role. It was up to the player who was in that position at that particular point of time. If Rooney was on the left-wing, then he tried to link-up with Evra or van Persie, while Kagawa got in between the lines. At the same time, Welbeck took up the striker’s mantle. Basically, the roles of the positions were fixed, but the players in those positions kept on changing. United will need to do the same in the new formation. As soon as the wingers drift in, the full-backs need to speedily move upfront and provide width (as highlighted above in the ‘Role of the wingers’) and attacking help to their attacking wingmen. What happens with most teams is that although the full-backs have to stretch the field of play, they don’t do it often enough or are too slow in doing so. Hence, if the centre gets crowded, the team’s attack renders futile. In the Southampton game, Jones was so quick in getting forward that Rodriguez even failed to track his runs and hence Jones and Welbeck were easily able to outnumber Fox. This helped Welbeck to drift in unmarked on several occasions as Fox was concerned with Jones. If Fox did track Welbeck, then Jones had acres of space for himself. Moreover, United’s attacks were so direct that by the time Rodriguez tried to catch up Jones, most of the damage had already been done. The full-backs have heavy attacking duties and the wingers are drifting in, so they can take additional time to drop back. Strootman will be very important for the United in this area as he can slow down the pace of the opposition’s attacks and give his colleagues the time to regroup. Nonetheless, someone like Evra or Rafael can stutter in this set-up as both can be caught way too high up the pitch. Although Rafael has scope for improvement, Moyes may need to find a replacement for Evra. Against Southampton, United’s switch of play was impressive. The heavily congested the left wing and then exploited the gap on the right flank via the marauding Jones. United have often utilized this tactic under Ferguson- overloading on particular side and then shifting play to the oppositions’ “weaker” side. The freedom of the attackers will only help this process as they can easily congest one wing before switching play with the help of Carrick. In the first-half against Southampton 51% of United’s passes were directed forward, even though the opposition was pressing aggressively. This just proves how fluid this system was. The counter-attacks in particular, were simply amazing. There was miscommunication but if the players are given the time to gel and adapt to each other’s playing style, this formation has a great potential. Surya Solanki is a freelance football writer covering the Premier League and African football. Being an avid Manchester United supporter for the past ten years, something always motivated him to go beyond just being a spectator, and gradually he began blogging about his views. He is currently a Manchester United critic at Goal.com and a correspondent for Football.com. I think you are trying to play too many to cure a problem that doesn’t exist, the diagrams and plays are very well, but if Rooney stays he will not be wanting to play on the “wing” or deep, he will want equal footing with RVP up front, that is the only way he will stay. Despite all the plaudits he got last year the player who has most to lose is Carrick if we get both Strootman and Alcantara, Strootman is Carrick and Scholes rolled into one player, if he hits it off with Alcantara, then Carrick will have to get used to the bench. The formation is more likely to be a 4-3-3 , or 4-3-1-2 very narrow on first sight, but with Evra/Buttner and Rafael providing the width, we would have no real need of the under performing Valencia, Nani and Young. Good Points , but the one i would hate to see go is Valencia, I’m afraid Young is not the Answer, and Nani is too inconsistent. Thanks for the read and comment. 1. Rooney has already played in this role. He can’t be the striker, he knows that, but still he wants to stay. As far as I’ve read Rooney has a problem with the deeper midfield role. 2. Strootman and carrick are two different players. Strootman is best utilised as a box to box. The guy loves to attack. Carrick is a deep lying midfield. I disagree with the gaffer here. I believe this formation is absolutely brilliant and Rooney wasn’t exactly happy playing behind rvp but the main problem was when Fergie left him out completely of the starting 11 against Madrid. Rooneys best position may be behind the main man(rvp) because i feel he has jus lost that yard of pace that made him the devastating striker he was. However, I do feel at times rvp needs a rest a Rooney/Hernandez are two brilliant strikers to come in for him. I do agree however that the 4-2-3-1 without any wingers should only be used for specific games where the opposing team tends to play through the middle. As I said rvp would need a rest and this is where if Rooney stays he could really prove if he still has the hold up play and the strikers game he once possessed. Overall I feel our signings determine who we buy and to keep our squad happy Moyes really needs to rotate well next season if we are to win more silverware. GGMU!!! Thanks for the read and comment! Good! you guys have spoken well, i could have contributed to the formation but, we h’ve n’t now the basic player for this season. In a four, three, three system. i would play rooney behind rvp as a support striker but often switch, kagawa on the left while a free role to drift, zaha/nani/thiago on the right. or thiago, strootman/carrick in the middle in a 4-3-3, orrrr a 4-1-3-2 take ur pick mix and match. I think David Moyes will play Rooney in his preferd position behind RVP and provided he stays fit thats where he will stay, that leaves us with the problem of getting the most out of Kagawa,who will be played wide left with a licence to cut inside same as in the Japan v Italy game where he played a blinder,Kagawa’s freedom in this role depends on the left back keeping the opposing rightback entertained,thats why its important we get Leighton Baines he’s the best around, Carrick is a gaurantee’d starter in any line up and hopefully we get Strootman alongside him in DM,on the right I think we will keep Valencia as his form gave signs of improvement alongside Thiago AM if all this happens I predict our midfield problems solved and a hell of a season ahead !!!! the problem is, rooney’s preffered position isnt behind rvp, not wanting to play behind him is basically what hes been complaining about. I think the stated formation of 4-2-3-1 utilising (a potential) Strootman, (potential) Thiago, Kagawa and Rooney is perfect and really is the only way to utilise all of our most talented players. Kagawa must play behind the striker in the number 10 because that is where he can be the most dangerous, he has the potential to be our player of the season next year if given free range. Those who say Rooney wouldn’t be satisfied with this role are also way off the mark. None of us know for sure what the issue is, but in my opinion it was down to the deep position he found himself in so often last season. He could be very effective there but doesn’t feel the time is right in his career for that, and fair play. But to be used as an attacking enforcer with Thiago and Kagawa, I think would suit him down to the ground, not to mention give him the free run across the front line that he does so well. There’s no defined wingers in this formation, but we know that the main wing threat would come through Evra (or potentially Baines) and Rafael. It’s also important to remember that the attacking 3 will be given ample opportunity to drift in an out of position as required causing an absolute nightmare for the opposing defenders. With Carrick and Strootman providing the defensive solidity whilst the others do their thing we could be a force against any team. Bearing in mind we can also switch to 4-4-2 to utilise players like Valencia, Zaha etc, or a 4-3-3 offensive changing to a 4-5-1 defensive. In the modern game, and with the type of players we appear to be going for the 4-2-3-1 is perfect. If we could get Rooney to stay, Thiago and Strrotman also in, i think both our attack and defense would be pretty formidable next season. Guys, the problem you’re debating does not exit. There is no ‘value’ in the market and the mentioned players won’t be joining. Probably Baines. In midfield we could use the 4-3-3 formation like the one used at Barcelona with Strootman being our Busquets just in front of the defence, with Carrick being our Xavi making the passes and Thiago being our Iniesta with a free roll to attack. But with Kagawa and Rooney not performing and wanting to play out of position we can have Kagawa in the number 10 role he was amazing at for Dortmund, just behind Rooney and RVP. Overall a 4-3-1-2 formation with Kagawa and Thiago rotating during a game and Strootman and Carrick doing the same when Kevin ventures forward. Another possibility is 4-1-2-1-2, the diamond formation that worked well against Newcastle last season, Strootman in front of the defence rotating again with Carrick on the right, Thiago left rotating again with Kagawa behind the strikers. Also Thiago and Carrick can be replaced by wingers who would be pushed wider when attacking.